A Brief History of John McCain and Rand Paul’s Sick BurnsThe two have been trading pot shots for years. Is the Far Right Going to Kill Trumpcare?It seems crazy, but they may have reasons that aren’t completely insane. Why Rand Paul May Not Want the GOP to Find Its Obamacare BillThe Kentucky senator is undermining the only version of Obamacare repeal that has any chance of passing — and he may be wise to do so. 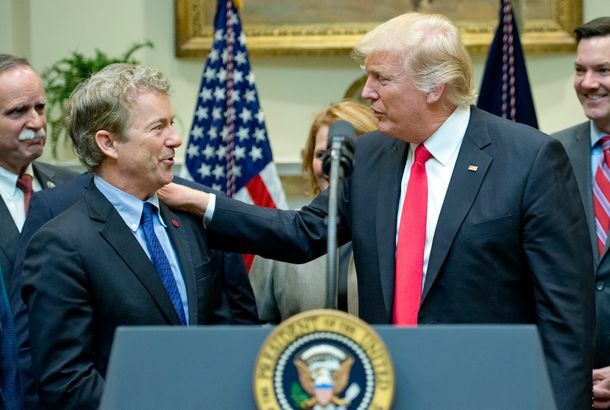 Fox News Congratulates Rand Paul For Being Loyal Trump Stooge [Updated]The task of suppressing dissent against the president’s authoritarian tendencies falls to the GOP’s libertarian. Trump Supposedly Opposes the GOP’s Obamacare Repeal PlanAt least, that’s what Senator Rand Paul is claiming. What now? Rand Paul Will Boycott Undercard Debate Because He’s Not ‘Second Tier’On this Festivus, the senator is attempting quite the feat of strength. Ted Cruz’s Foreign-Policy Stance Is Outdated, But It Might Still WorkMaybe being between Rand Paul and Marco Rubio and near Donald Trump is the right place to be. GOP to Rand Paul: Maybe Just Stick With SenateThey want him to focus on his Senate seat. Rand Paul: Let’s Not Impinge on Your Boss’s Freedom to Fire Gay PeopleHe is having another libertarian moment. Rand Paul and the Fizzling of America’s Libertarian MomentIt was overhyped from the start — but he certainly didn’t help. Rand Paul Reminds Ted Cruz That No One in the Senate Likes HimFinally, a 2016 beef that doesn’t involve Trump. Rand Paul Won’t Have to Give Up His Senate Seat to Run for PresidentNow he just needs supporters. The Winners and Losers of the First GOP Presidential DebateThe pundits have weighed in. No White House for You, Rand PaulThe candidate who Rand his campaign into the ground. The Best and Worst of the 2016 Campaign MerchHillary Clinton pantsuit T-shirts, Rand Paul sports bras, and so much more. How the 2016 Presidential Candidates Have Responded to CharlestonWhile the Democrats bring up racism and gun control, the Republicans are talking about evil. Desperate-for-Attention Rand Paul Unveils Flat TaxCandidate wins coveted endorsement from team of kooks. Rand’s Favorite Band Thinks He’s RacistRush’s drummer says he’d never vote for Paul. Rand Paul’s Bizarre WWE-Style Super-Pac AdIt’s way too early for this. An Annotated Guide to Rand Paul’s Us Weekly FactsOld Rand loves a good root-beer float. Rand Paul Uses ‘Filibustering’ As Excuse to Give Really Long Campaign SpeechThe presidential candidate wants to talk about privacy even if it means no one gets a three-day weekend. Rand Paul’s Son Pleads Guilty to Driving Under the InfluenceWilliam Paul was cited for drinking and driving in April. Rand Paul’s Son Cited for Drinking and DrivingWilliam Paul was issued a citation on Sunday for operating a vehicle while under the influence. Rand Paul Promises to Illegally Trade Weapons for Hostages With IranIf we take him at his word, anyway. Rand Paul Is Interesting, Said EveryoneSometimes, it feels like the only adjective people have been able to apply to the soon-to-be candidate. Harry Reid Thanks Rand Paul for the Eye TipsThe possible presidential candidate is basically Congress’s WebMD. Rand Paul Looks for ‘Pot-Smoking Austinite’ VotersLooking for young Republicans at SXSW. 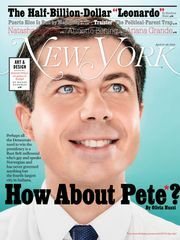 Real-Life Ron Swanson Afraid of Being Compared to Ron SwansonFrankly he should be more afraid of comparisons to Ron Paul. Pinterest Deletes Parody Page Rand Paul Made to Troll Hillary ClintonRand Paul will troll on.